There are a lot of surveillance cameras in St Petersburg. Since autumn 2018, high-resolution cameras with data recognition and analysis have been added to conventional cameras. The system allows to recognize faces in real-time mode, record biometric models, synchronize data flows and track movements around the city. Additionally, cameras recognize car license plates, allow recording the left items and identifying the danger of emergencies. There are now 80 smart cameras and their number is constantly increasing. In the near future, the video surveillance network with facial recognition will cover the entire transport infrastructure, including the metro, key institutions, and streets of the city. First thing you should write down is the phone number of Russian emercom you must dial from your mobile in case of fire, violence, robbery and need for medical help: 112. You can dial this number if even your phone wallet is empty. We have listed a few factors that can give to your trip bitter taste. While ones like pickpockets don’t need to be explained, some ones are being followed by our comments. 1. Pickpockets are in cafes, public transport, pubs, near tourist landmarks. The most dangerous places are metro and the Nevsky prospect as well as shopping malls. 2. Traffic. The streets of the city are full of cars. Though why full? No, overcrowded. And traffic rules don’t always work since many drivers prefer little violations to waiting for their green light at an intersection. Some tourists cannot rapidly get used to intense traffic and some aggressive manner local drivers are behaving in. 3. Robbery, muggings are rather rare in St. Petersburg in comparison to more popular European destinations, but still sometimes occur. Advice here is simple: don’t show your richness, valuables and use credit cards instead of having a lot of cash. 4. Winter. This season brings a lot of injures because of slippery sidewalks and icicles falling from roofs on heads. It’s unfortunately typical for the city because of temperatures hesitation around zero degree °C that leads to ice formation on the streets and roofs. In snowy winters this problem is coupled with the necessity to pave the way through snowbanks. More about climate and weather In St. Petersburg see here. 5. Rent apartments. A very good alternative to hotels often overpriced during the high season, but swindlers often produce some tricks to pull your money from you instead of providing you accommodation. The most frequently used scheme is when you pay a fee to a “realty agency” whose task is to find an apartment for you and deliver information about you to an apartment owner. When comes the time for a meeting with the owner it somehow happens that the owner disappears, doesn’t respond to calls and so on. The fee paid to the agency is not being refunded since that’s payment for information service (looking for an apartment and information exchange). The agency is not responsible for the disappearance of the apartment owner. The fee is usually rather small, not the sum worth calling the police. About how to avoid this read our post on rent apartments in St. Petersburg. 6. Taxi drivers. There are two options of getting in trouble here. The first is when you hail an officially marked and registered taxi and negotiate the fare with the driver directly. The possible danger here is a beautiful chance to pay a few times more than in case of booking by phone through a taxi service. The second option doesn’t regard to taxi directly, but anyway to getting around by car. When you hail an unofficial taxi, just any car in the street to transport you somewhere, there is always a risk to be robbed and find yourself outside of the city in the middle of nowhere in the middle of the night. Our advice here is to have a list of taxi services for booking by phone. Also read our post about taxi in St. Petersburg here. 7. Political protests. St. Petersburg is dubbed the city of three revolutions which changed the power in the country and transform the life in many other countries. The fact that it is the home city of two last Russian Presidents, Vladimir Putin and Dmitry Medvedev, doesn’t help when some people are willing to express their disaffection. 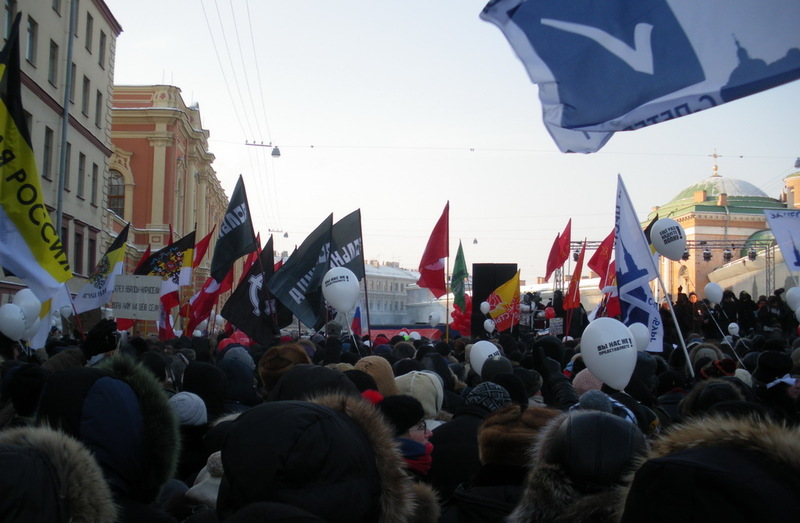 Protests to support leading opposition leaders, civilian rights, actions against city government construction and architecture policies and so on – all included. Often the protests are not permitted by the authorities, so the participants are frequent guests of police departments. Usually it results into enquiry and record, then release within 24 hours. You are as a foreign citizen may face deportation, which is, of course, an adventure to tell your grandchildren, but also will mark your final days in Russia in all your life. All these risks are manageable by buying services from reliable suppliers and not making stupid things. So all of our pieces of advices are ordinary and fit any location across the globe. When coming out, take with you a passport with a registration document. There is a very little chance of that happening, but anyway the police may want to check your papers. Most frequently these checks are being conducted in the metro. Also make a photocopy of all your documents which can be useful in case of loss of the passport. 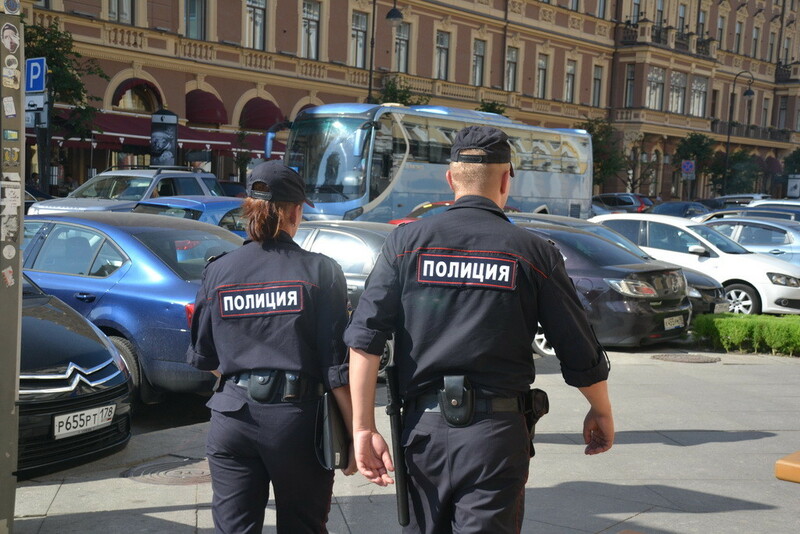 Russian police is said to be corrupted, lazy, rude and offensive toward citizens, a few years ago the press was full of stories of inappropriate conduct of policemen. Things seem to be changing now, at least in St. Petersburg. We cannot remember any bad-police-story in recent times. Neither had we any contacts with the police that left any negative impressions. So, don’t hesitate to communicate with the police in case of emergency. Do not undervalue the local weather which is very capricious. Some travelers are glad to see +1 degree Celcius predicted by an Internet forecast for the time of their trip to St. Petersburg and come in spring-styled clothes to feel a wind from the Gulf of Finland and face -7C on the next day after arrival. Neglecting here results in additional expenses on warm clothes and medicines to cure influenza. And take with you an umbrella, of course, since it can be drizzling throughout the year.